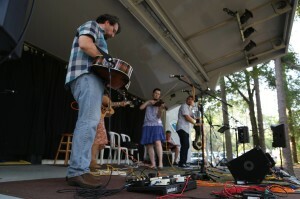 The 62nd annual Florida Folk Festival, at the Stephen Foster Cultural Center in White Springs, Florida, lived up to its reputation for heat, bugs, and a lot of great music and fun. 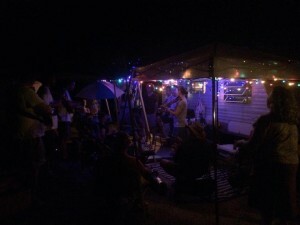 We had a spectacular weekend, with absolutely epic late-night jams at our campsite. We established our usual campsite compound, with a ragtag collection of tents and campers. 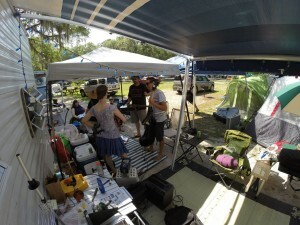 This year, we shared our little compound with Mindy Simmons and the Hot Pockets (Lisa and Annie). We should say that they shared the camping spot with us, for which we were very grateful. There is always a mad rush for camping spots on Thursday morning. As an added bonus, this led to a collaboration on stage. Passerine, on the Azalea Stage. On Friday, we played our first set at 5:30 on the Azalea stage, closing out that stage for the day. In spite of the late afternoon heat and the approach of dinner time, we had a good crowd– including a bunch of old friends stopping by to see us. The day didn’t end with the closing down of the official stages. 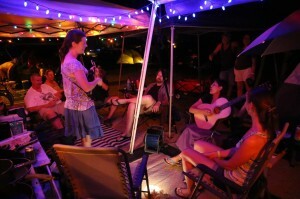 It started out with just a sprinkling of people gathering at our campsite, sharing songs. We had our neighbors, Mindy & the Hot Pockets, and we were joined by our new friends, the Currys (definitely worth checking out this great band that we had just seen at GambleFest). Soon, more and more people began to gather– some joining in, some gathering just to listen. Our erstwhile bassist, Andres Colin, performed a beautiful duet with his equally talented better half, Kristen (who was also the photographer for the weekend). We discovered that Andres, aside from being an outstanding bassist and talented singer/songwriter, is also a skillful jam host, handing his guitar around and coaxing people out of the surrounding darkness to step into the light and do a song. On Saturday, we had the challenge of following Jim Stafford on the “Under the Oaks Stage.” As we waited for our set, he had the crowd roaring with laughter with his songs and stories. (You might remember Jim Stafford from his hit, “I Don’t Like Spiders and Snakes,” and from his stint on the Smothers Brothers Comedy Hour.) Tough act to follow, but he left us with a great crowd, all warmed up for whooping and applauding. They even gave us a standing ovation at the end of our set. There was a major power outage about about 5:30 on Saturday, right in the middle of Mindy & the Hot Pockets’ set. They finished their set without sound reinforcement, which was actually pretty great. Everybody quieted down and became a very appreciative listening audience. 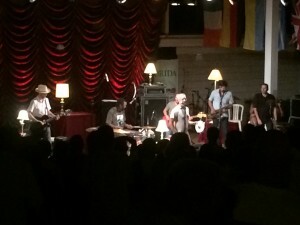 We learned that it wasn’t just that stage but the whole park and the neighboring town of White Springs had lost power. At first we were afraid that we had caused it, since we had overloaded the circuits in the campground the day before, with too many campers plugged in to one pylon. A remarkably patient and heroic guy from the Park Service had come out and replaced the burned out receptacle, and then helped us figure out how much load we could put on it without burning it out all over again. This time it wasn’t our fault, however. Saturday night, we went down to the Amphitheatre stage to see the headliner for the weekend: J.J. Grey and Mofro. The opening acts on the main stage had to perform with only a few LED lights to case the stage in a red glow, running on the backup generator along with the sound system. Just before JJ Grey was scheduled to go on, however, they got power back so we got the full effect. On Sunday afternoon, Mindy invited Carmela and Sara to join the Hot Pockets for a couple of songs. The five of them did a breathtakingly beautiful and moving version of “One Voice” (originally recorded by the Wailin’ Jennys). 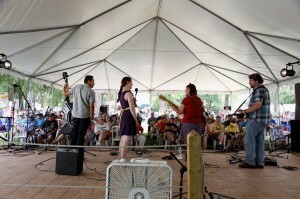 We played our final set on the “Heritage Stage,” finishing well before the rains came in that evening. We were sandwiched between the astonishing guitar work of Michael Jordan and the swampy Florida blues of Ben Prestage, so we were fortunate to be in good company and once again to have an enthusiastic and appreciative crowd. And it was a thrill when Mindy & the Hot Pockets joined us for “Hard Times Come Again No More.” Sweet five-part harmony, just as if we had actually rehearsed it! For a sampling of the weekend, here’s a video that Andres Colin, our Jam Master Extraordinaire, has edited together.